Great strides have been made in reducing maternal and child mortality – with a 47% reduction in maternal mortality and a 49% reduction in child mortality since 1990 – demonstrating that change is possible. While there has been substantial progress, much remains to be done. As we transitioned from the MDGs to the SDGs, it became imperative to accelerate momentum for women and children, but also to protect the often fragile gains in some countries, as witnessed with the impact of recent epidemics, growing antibiotic resistance and weakened health systems on the health and survival of the most vulnerable amongst us. Launched in September 2010 by the UN Secretary-General, the Global Strategy for Women’s and Children’s Health (2010-2015) contributed to significant progress worldwide for women’s and children’s survival and health. The Every Woman Every Child movement that grew out of the Global Strategy mobilized actors from all sectors to work towards shared goals. Strong progress has been made toward the vision to end all preventable maternal, newborn, child, and adolescent deaths within a generation but there was still unfinished business and new challenges that need to be addressed as we transitioned from the Millennium Development Goals to the Sustainable Development Goals agenda. An updated Global Strategy for Women’s, Children’s and Adolescents’ Health was developed to build on new evidence, including the need to focus on critical population groups such as newborns, adolescents and those living in fragile and conflict settings, build the resilience of health systems, improve the quality of health services and equity in their coverage, and work with health-enhancing sectors on issues such as women’s empowerment, education, nutrition, water, sanitation and hygiene. The updated Global Strategy was aligned with the targets and indicators developed for the Sustainable Development Goals framework and outline opportunities for means of implementation, including innovative financing and the Global Financing Facility in support of Every Woman Every Child. To build the political support needed to develop and implement an updated Global Strategy, it was essential to demonstrate how the Every Woman Every Child multi-stakeholder partnership and accountability models have contributed to accelerated progress for women’s, children’s, and adolescents’ health. A Progress Report was launched in March 2015 that documented progress, lessons learned, and the added value of partnerships facilitated under the Global Strategy. It also looked at the unfinished business and set-up the rationale for an updated Global Strategy for the 2016-2030 period. The next Global Strategy will be launched at the UN General Assembly in September with a draft five-year implementation plan and will be proposed for formal endorsement at the World Health Assembly in May 2016. A set of supporting technical papers was produced during the process of updating the Global Strategy and later published as a special supplement of the British Medical Journal: Towards a new Global Strategy for Women’s, Children’s, and Adolescents’ Health. Below are key milestones, products and institutions involved in the process of updating the Global Strategy for the SDGs. The Strategy and Coordination Group, led by the Executive Office of the Secretary-General, made up of eminent persons, managed decision-making and political mobilization. Members of the group were composed of the work stream leads and constituency representatives nominated through a process managed by PMNCH. This report outlined the progress made towards accelerated progress for women’s, children’s health and lessons learned on partnership and accountability demonstrated under the EWEC global multi-stakeholder partnership approach. It also set the rationale for continued and accelerated action for the unfinished MDGs agenda. 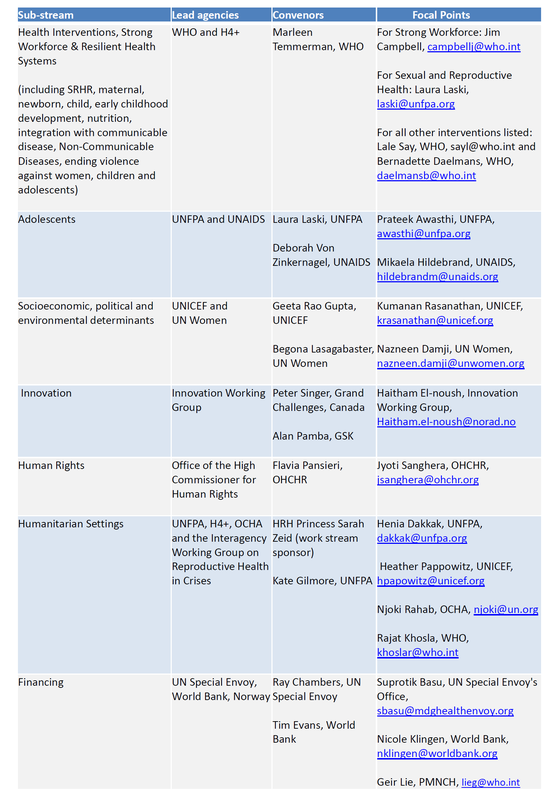 Round 1 (Feb-March 2015) asked stakeholders about their priorities for developing an updated Global Strategy for Women’s, Children’s and Adolescents’ Health. Round 2 (May-June 2015) sought comments on the first draft of the updated Global Strategy, which was then posted on the Every Woman Every Child website. PMNCH produced summary reports that synthesized the feedback received through each of the consultation rounds.These summary reports was also be posted on the interactive consultation hub.